Vengeur Masque attempts to enhance his Cups aspirations in Saturday’s The Bart Cummings over 2500m at Flemington on Saturday. The French import has had two starts back this preparation and Mike Moroney is still committed to gaining starts in the Caulfield and Melbourne Cup. 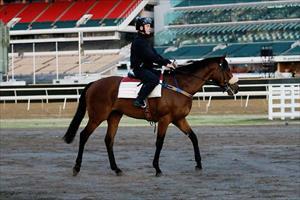 “He looks magnificent and he’s getting up to his right distance now,” Moroney said. The one dampener on the trainer’s enthusiasm is the barrier draw. “It would have been ideal to draw a single figure barrier but we’ve got 10 and that’s the way it is,” Moroney said. “Ideally he can get some cover and relax. He’s a horse that can race forward but we’re trying to teach him to relax to get the trip. Vengeur Masque is considered one of the outsiders by bookmakers but Moroney is confident of a forward showing. “Obviously Almandin is the horse to beat but our horse has been running well over unsuitable distances and he gets his chance on Saturday and I’m expecting him to run very well.” Moroney said.